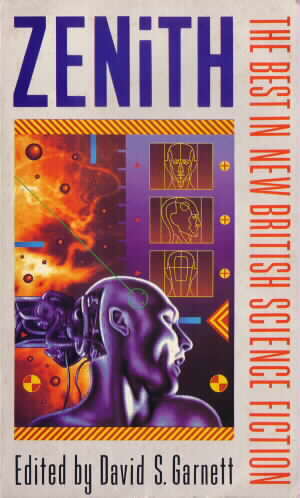 Zenith Edited by David S.Garnett A book review by jpoc. Unlike many other collections of SF short stories, David Garnett's "Zenith" anthologies contain only original works and he limits himself to tales written by authors with a British connection. This book, the first of a very short series contains 12 stories all written in 1989. Almost as interesting as the stories and occasionally more so, are the Editor's introductions which dispense with the usual reverence and make do instead with a refreshing mixture of wit, bile and sarcasm. The real problem with this book is that only half of the stories in this collection really merited publication and nothing stood out as being especially good. Storm Constantine's "The Pleasure Giver Taken", Gary Kilworth's "White Noise" and William King's "Skyrider" were all interesting and well written tales. (For more information on the stories, please see below.) Unfortunately, they were rubbing shoulders with pieces such as Robert Holdstock's "Time of the Tree" which was no more than an idea described and not a story. I do not expect any collection of SF short stories to be perfect but I am afraid that this one has too few gems in the dross for me to recommend it. Five out of ten. Don't bother. It's out of print but what about these? Holdstock, Robert: "Time of the Tree"
Bayley, Barrington J.: "Death Ship"
Constantine, Storm: "The Pleasure Giver Taken"
Aldiss, Brian W.: "Days in the Life of a Galactic Empire"